It took him nearly 10 years, a journey that began in the fall of 2002, when Devenport came up with the idea of building a steel boat - a big one - after reading a book on metal-boat construction by designer Bruce Roberts-Goodson, an Australian who now lives in Spain. He chose to build the Spray 52, Roberts-Goodson&apos;s rugged oceangoing displacement trawler with a bottom based on solo circumnavigator Joshua Slocum&apos;s sailboat Spray, hence its name. "I&apos;ve always done a lot of metal fabrication," Devenport said when I first interviewed him in the summer of 2009. "I have always had precision sheet-metal shops. I&apos;ve built airplanes and stock cars - that sort of thing. [Building with metal] is not that difficult for me." Building the boat proved easier than finding the time and money to devote to the project, but Devenport is mostly finished. A crane hoisted Sun Chaser, with her navy blue hull and bright yellow boot stripe, March 11 into the Intracoastal Waterway in Wabasso, Fla., but not before Devenport&apos;s 4-year-old granddaughter, Megan Devenport, christened the trawler - with a bottle of milk. His other grandchild - Megan&apos;s twin Benjamin - also was there, along with Devenport&apos;s wife, Jean, and the couple&apos;s two grown daughters, Dawn and Deana. In all, about 45 family members and friends took in the scene on a sunny, blustery day. "It was great, nothing like it," Devenport says. Devenport owns Vero Beach Fireplace & BBQ, and he built Sun Chaser in a warehouse attached to his office building. "Gil certainly used all of his creative genes and mechanical ingenuity on this huge project, and certainly it is hard to believe he was able to do it solo," says Jean Devenport, who is 65. It was a tough road, and the month before the launch might have been the most stressful and difficult time for Gil Devenport. Several plans to transport the boat were scrapped because of its size and municipal regulations. The backside of Devenport&apos;s warehouse - a huge aluminum shed - had to be removed to extricate Sun Chaser. Then the pilothouse had to be removed so the boat could make it beneath overpasses as it was trailered about 10 miles to the water. And, of course, the house had to be reinstalled. All of this took about three weeks. Three friends - Tom Granims, Scott Davis and Clark Giangarra - helped Devenport get the boat from the warehouse to the water. "The launch went smooth, but everything that [preceded] it was a challenge," Jean Devenport says. "We are looking forward to trips to the Abacos and a South American trip with friends in the future." I caught up with the boatbuilder in early April. Sun Chaser was docked at a yacht club in Wabasso. The trawler draws 6 feet. "The boat will eventually go down south," Devenport says. "This thing will see some weather, and that&apos;s why I built it. 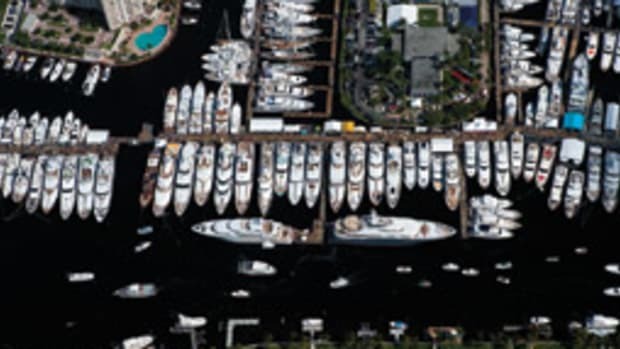 It&apos;s not meant for the Intracoastal." In addition to the Abacos, the Caribbean and South America, Devenport says he might journey to the Antarctic. But for now, the boatbuilder - dressed in baggy jeans, a shirt with a few dime-size tears and work boots - seems more interested in tying up some loose ends with his trawler than talking to me about cruising destinations. He tells me the fuel tank needs immediate attention and he mentions that the boat still has no electronics. He also needs upholstery for the settees, including those in the pilothouse and saloon. But I hang around long enough to hear about his first few trips aboard Sun Chaser. "We hit a 20-ton boulder in the inlet," he says. "It hit the starboard stabilizer. We had no damage. It has great ride. This thing throws tremendous walls of water." Regarding stability, he says, "It doesn&apos;t roll. 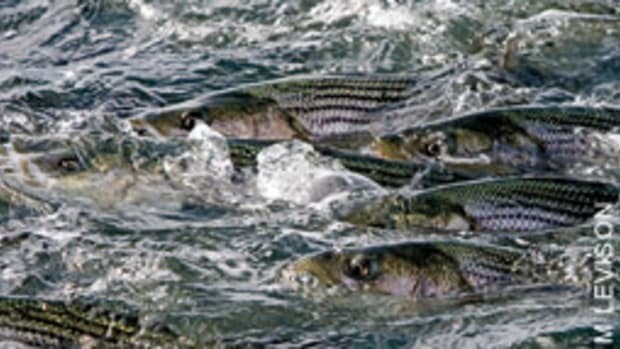 Trawlers are rollers; this is not." The stabilizers are rectangular steel appendages welded to the hull that extend downward from the chines on each side of the boat. The appendages run fore and aft, and the bottoms are level with the keel. "You can put a glass of water on the Portuguese bridge and it doesn&apos;t move," he says. 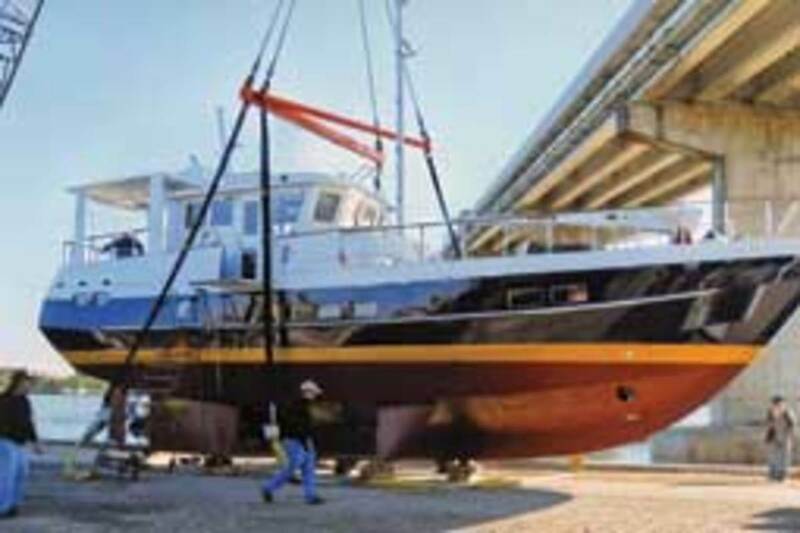 In the spring of 2009 I saw an image of Devenport&apos;s boat online, its pilothouse nearly hitting the ceiling of the warehouse where it was being built. One man building an oceangoing steel trawler - good story, I thought. I made the 200-mile trek from Sarasota to Vero Beach Fireplace & BBQ and spent about two hours with Devenport. "I prefer this type of boat because I want to be able to go anywhere, anytime," Devenport said as he sat behind his desk, the yacht&apos;s design drawings spread out in front of him. "I wanted something that could carry a lot of fuel and be able to complete a passage, a crossing. This boat holds 3,000 gallons." Roberts-Goodson designed the Spray 52 and its big brother, the Spray 58, in 2000. "There are 12 of these versions either under construction or already completed at this time," the designer told me in an e-mail. 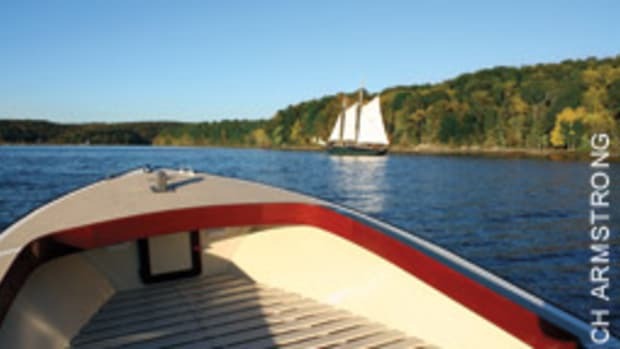 "Both trawlers were designed to function either as commercial or pleasure boats." The Spray 52&apos;s "multichine hull form, with its traditional long keel and unique hull balance, is famous for its ability to hold a course with very little effort on the part of the helmsman," Roberts-Goodson says. "The hull form also makes for a stiff boat with a maximum heel of 15 to 20 degrees in all but the most extreme conditions." In 2002, Devenport bought Roberts-Goodson&apos;s Trawler Yacht Kit. Soon thereafter, he began to build. At times, Devenport had to battle to keep his project alive. The hurricanes of 2004 severely damaged his home in Melbourne Beach, his office building and its adjoining shed. "The hurricanes beat the hell out of us," he says. "[Hurricane] Jeanne held me up, so the boat sat for six to eight months." The recession took a toll on his business, so there was less money to put into the boat. Determining how to transport Sun Chaser to the water and finding enough water to launch her were major headaches. Friends may have helped at the bitter end, but otherwise this has been a one-man effort. Devenport worked on the boat at night and on weekends, and sometimes during the day in the workweek when business was slow. "I built the whole boat with [the] forklift," Devenport says. The 20-by-8-foot, 5/16-inch-thick hull plates weigh more than 2,000 pounds each. He installed the 6-cylinder, 250-hp John Deere diesel by himself. "I pushed it in there," he says, pointing to the engine room doorway. "I used a ramp and muscled it in there." 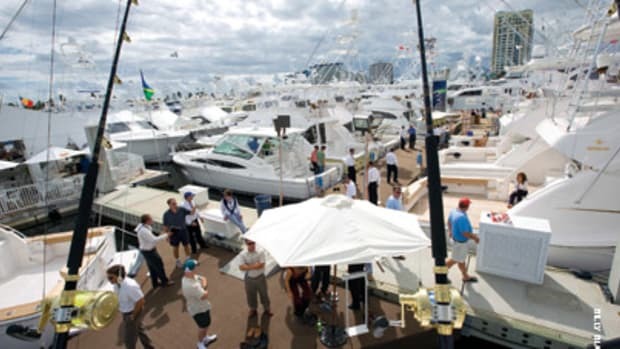 Devenport even fabricated and built Sun Chaser&apos;s hydraulic crane and mounted it on the foredeck. Working with tons of steel invites hazardous situations, and that&apos;s why Devenport chose to do the work himself. "I don&apos;t want to put people in here and have them get hurt," he says. Devenport suffered two injuries - broken fingers and trauma to the face. Both could have been much worse. His hand got caught between two hull plates while he was adjusting them, breaking "a couple of my fingers," he says. "Fortunately, I always carry a small crowbar with me and a screwdriver. Otherwise I would have had a real problem. I was by myself at night, about 9 o&apos;clock. I was able to pry my [fingers] out of there." The second accident occurred when one of the steel plates smashed into the side of his face and "nearly tore my head off," he says. "One of the forward hull plates slipped and knocked me up against the wall. I thought I broke my jaw. My jaw felt like mush, but it was blood inside my mouth. I had blood all over me. It looked worse than it was. I had some dental issues, but that was about it." Devenport chose the Spray 52 because it&apos;s a proven workboat design. "If a storm kicks up, you close down the hatches and go. You don&apos;t run home," he says, "you just weather the storm. This boat is in the Bering Sea, working. It&apos;s a fishing boat. 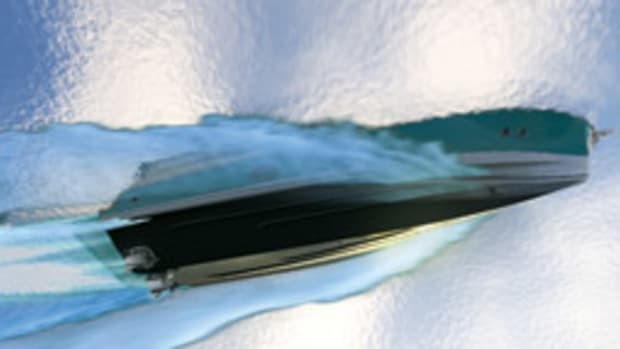 This boat can withstand crashing into ice. I don&apos;t know why steel boats are not more popular - maybe because they&apos;re more difficult to build." His decision to use hydraulic rather than electric machinery also was influenced by those Bering Sea workboats. "The hydraulic equipment is the equipment the crab boats use. Anything they use, I want to use," Devenport says. "They can&apos;t afford for it to break. They&apos;re not putting cheap equipment on their boats, because they have to make money." 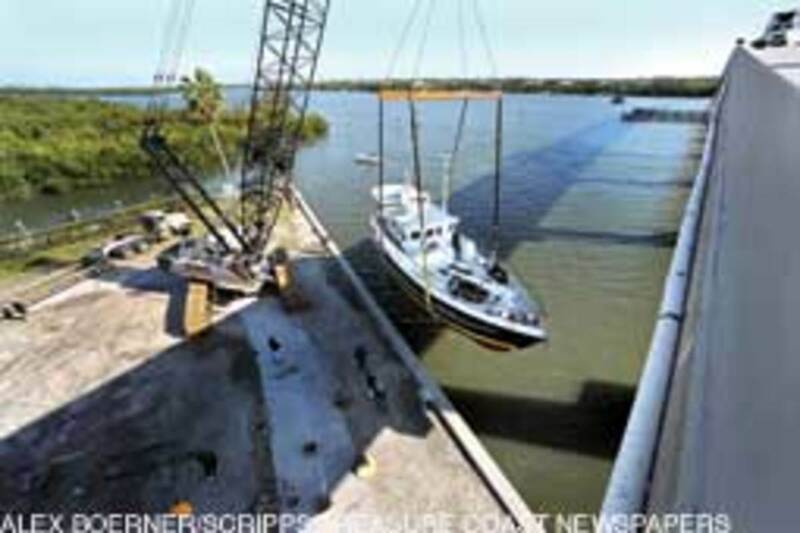 On Sun Chaser, hydraulic components include the 3,000-pound-capacity deck crane, the windlass, the aft winch, the steering system and the boarding door. Devenport wanted no part of installing and maintaining the wiring and cables of an electric system. "Cables are very expensive," he says. "Once the hydraulic systems are in, they&apos;re in. It&apos;s a done deal for life." Using all hydraulic equipment was a wise move, according to Roberts-Goodson. "On a boat of this size it&apos;s a good idea and is a method we would recommend to any builder of a boat over, say, 50 feet," the designer says. 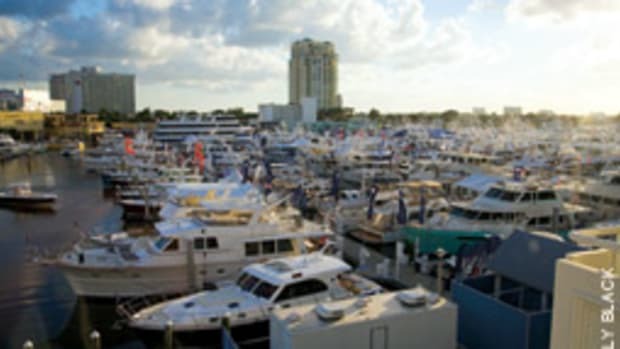 Devenport subscribes to a philosophy of simplicity when it comes to how a boat should be outfitted, operated and maintained. "I am not into continually working on boats and cleaning them," he says. "I want everything simple. Hey, if you&apos;re going to enjoy the boat, enjoy the boat. I want minimal maintenance." Sun Chaser&apos;s teak deck rails and their stainless-steel stanchions will remain untouched - no varnish or polish. The rough-and-rugged look is just fine with Devenport. And when he does need to work on a tank, the engine, a filter or some other component, he wants easy access to it. To that end, he opted to put no insulation below the waterline. "If you insulate below the waterline and you have a problem, you&apos;ll have trouble finding it, and the job will become all that much bigger," he says. "I want to open a hatch and look down and see the painted hull - not insulation." 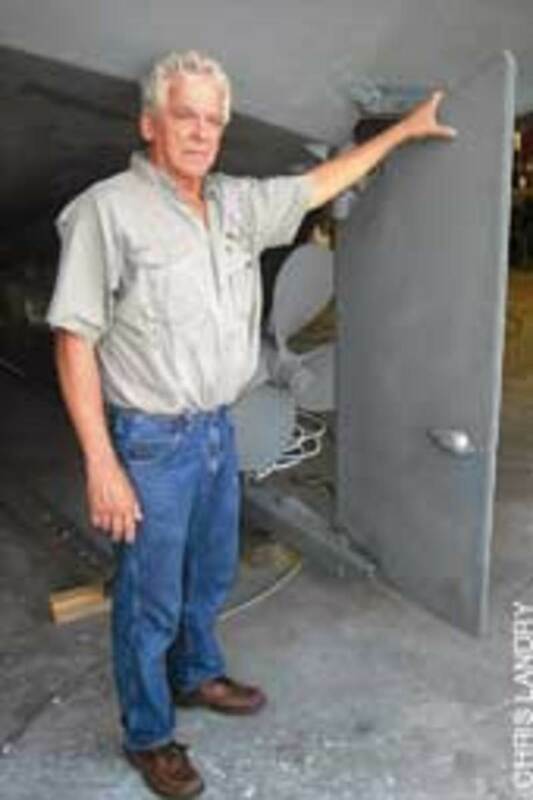 Rather than use a seawater cooling system, Devenport installed two heat exchangers in recessed areas on each side of the keel, also known as keel coolers. One cools the John Deere, the other the diesel generator. There are no raw-water cooling circuits. A dry stack cools the exhaust. Sun Chaser&apos;s ground tackle is stowed outside the bilge to avoid that corrosive environment. "I don&apos;t send anything downstairs," Devenport says. "I don&apos;t want anything wet going inside the boat. Steel corrodes from the inside out." Devenport says he sandblasted pretty much the entire boat, inside and out, before priming, rather than using preprimed steel. "It&apos;s about the worst thing anyone can do. That took about a month and a half," he says. "This is before priming the boat inside and out. I would never do that again." Although her pilothouse is aluminum, Sun Chaser&apos;s hull is all steel. The keel is 1/2 to 3/8 inch thick. The hull bottom and sides are 5/16 inch, and the decks are 3/16 inch. The foredeck section where the crane is mounted is 3/8 inch. Devenport had the hull painted with Awlgrip. He used 1-inch-thick glass for the pilothouse windows and for the portholes. Only two pilothouse windows can be opened. "Windows that open don&apos;t work - they leak, so why bother?" Devenport says. "The only two that open are the aft windows. If you want ventilation, all the hatches open." And the boat has a heating and air-conditioning system, he says. 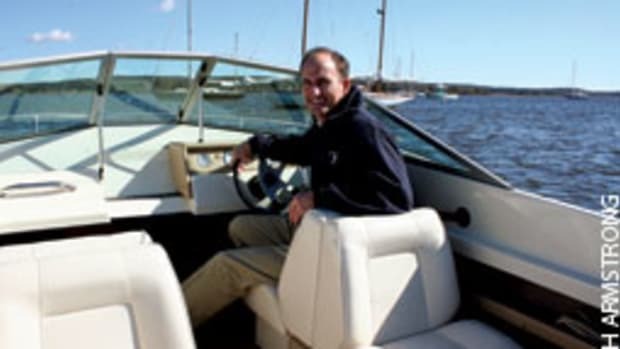 Devenport likes the safety aspects of the boat&apos;s design, including the 42-inch-high deck railings. "If you fall off this boat, you need to be drunk and stupid," he says. 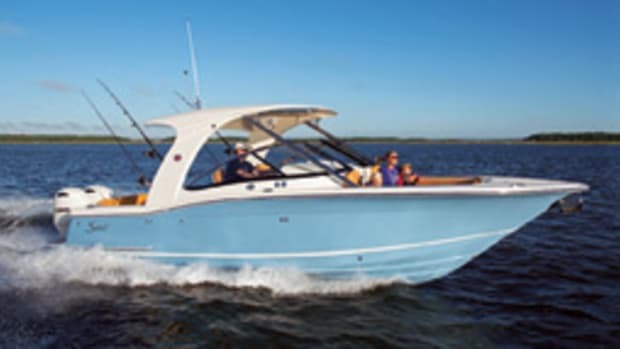 The port and starboard sides of the pilothouse each have a door, and the house&apos;s top extends over the Portuguese bridge, which increases weather protection, as does the reverse-raked windshield. The centerline helm includes a destroyer wheel, and the engine and system gauges are mounted to starboard of the wheel. A panel below the windshield is for flush-mounted electronics. The starboard side of the helm area also serves as a chart table. A dinette table and settee with a backrest are in the aft section of the pilothouse. All are constructed of stainless steel. Those high rails surround the aft cockpit, and a hardtop covers the area. The side decks lead to the Portuguese bridge and its second helm station. A walkway on the port side leads to the foredeck. All deck hatches are raised, and a large access hatch is just forward of the Portuguese bridge. There&apos;s a circular deck hatch on the port side abaft the hydraulic crane, which is mounted abaft the windlass, with its chain rode. The companionway is to port of the helm and the stairs are too steep, according to Devenport, though handrails flank the passageway. In fact, there are handrails at every turn on Sun Chaser. A dinette table and settee are immediately forward of the companionway stairs. The fully equipped galley is across from the dinette, and the washer and dryer are in a stacked arrangement forward of the galley. Sun Chaser has forward and aft staterooms and two heads, both with separate showers. The aft stateroom&apos;s head also has a tub. Devenport and I didn&apos;t spend much time on the details of the accommodations, which were unfinished, but the engine room got my attention. Its door is immediately to starboard of the companionway stairs, and the space is beneath the helm deck. The John Deere is mounted on centerline, with the generator to starboard. "You can put your hands on everything," Devenport says. "I am not into crawling through hatches or cutting out decks. I have a friend who put a generator in, and he had to cut the deck out of the boat. That&apos;s poor engineering." All machinery on Sun Chaser can be removed through a 72-by-36-inch hatch forward of the Portuguese bridge. Devenport has a few gripes. He says he would have preferred a smaller pilothouse to free up space for a separate area where guests could socialize, and a dive platform off the transom would have been nice. "But this is a following-sea boat," he says. "You can&apos;t put one on because the seas would be too hard on it." Roberts-Goodson has not yet seen Devenport&apos;s rendition of the Spray 52, but he has followed its progress and posted a photo of the vessel on his website, www.bruceroberts.com. "Gil has kept me up to date with construction photos and comments all through the construction process," says Roberts-Goodson. "Gil has done a wonderful job of building this boat." Indeed, it is a milestone, Jean Devenport says. "Gil has built many things, but he outdid himself this time," she says. "Gil has a pirate in him and needs to let it out with the Sun Chaser."